Please check that you have filled in our membership form on this page. The membership fees are EUR 10 for ordinary members and EUR 50 for supporting members. Pay the correct amount using our bank account FI80 1237 3000 1333 11. Use the reference number 1012 (ordinary members) or 1232 (supporting members). The Climate Parents Finland mailing list is only accessible to members (unfortunately the messages are currently only in Finnish). To join, contact us at jasenrekisteri at ilmastovanhemmat.fi. If your name or e-mail address has changed, please send your new contact information to jasenrekisteri at ilmastovanhemmat.fi. News on climate change may feel distressing, but involvement in Climate Parents Finland is good fun. Join us and find out for yourself! There are a range of tasks available, from baking to lobbying. All types of volunteering are equally valuable. We have organised our activities in three groups. Find the one that is best for you and join! 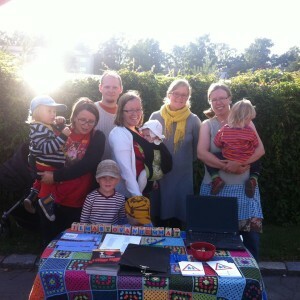 Climate Parents Finland attending Roihuvuori Days.